Bronzeback, brown bass, brownie, smallie, bronze bass, bare back bass. Typically green or brown with vertical dark bands along the side, and red eyes. Unlike the largemouth bass, a smallmouth's upper jaw never extends past the eye. Generally no more than 6 pounds (2.7 kg), but can grow to be upwards of 12 pounds (5.4). Originally native to the Mississippi River basin, Great Lakes area, and north toward Hudson Bay. Now the fish is stocked in nearly all of the lower 48 states. Crayfish, small fish, aquatic and terrestrial insects, worms, frogs and tadpoles. 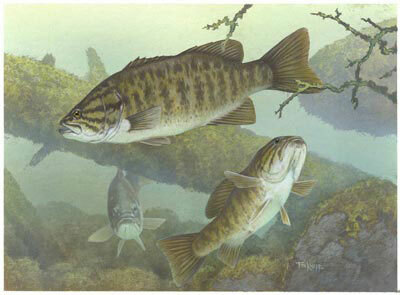 Smallmouth bass prefer clear-water lakes and cool streams with gravel or rocky substrate. Spawning takes place in the spring when water temperatures reach 60 to 75 degrees Fahrenheit (15.5-24°C). Nests are built on gravel bars in three to 20 feet (6m) of water. The male drives a ripe female to the nest. After she lays her eggs, he searches out another, and then frequently a third female. Each female lays from 2,000 to 7,000 eggs per pound of body weight. Little or no parental care is provided after hatching. Muskie, pike, walleye, turtles, and catfish. Information above courtesy of Oklahoma Department of Wildlife Conservation and Texas Parks and Wildlife Department. What Kind Of Fish Are Smallmouth? 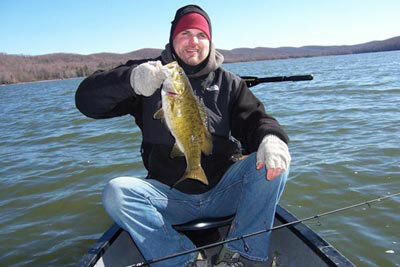 Smallmouth generally refers to one of the more popular game fish out there, the smallmouth bass. Also called smallies, these freshwater fish inhabit the temperate waters of North America. They have been stocked throughout the continent as a sport fish for freshwater anglers. Belonging to the sunfish family, smallmouth bass tend to weigh between two to six pounds, with females being the larger of the species. The basic rule of thumb is that the warmer the water the fish is found in, the larger it is going to tend to be, thanks to increased feeding time throughout the year. In terms of appearance, the fish tends to mirror its surroundings for better camouflage: the brighter the environment, the lighter the scale color. They may not grow as large as their more popular cousins, the largemouth bass, but pound for pound smallies tend to put up a better fight when reeling in, though they usually do not jump out of the water when putting up a fight. What Is Fishing For Smallmouth Like? Those who are going after smallmouth can use a variety of different tackle and styles of approach. It is just as common to see fly fishing for smallmouth as it is to see anglers making use of the more traditional spinning or bait casting rigs. The choice is up to you, but the right books and expert advice from those experienced in catching this fish can go a long way towards helping you get to be something of an expert on this particular species. It should be noted that smallmouth can be quite picky about what they will pursue in terms of bait. It may take some time to get used to exactly what approach is going to offer the best pay off. They are not quite as picky as many trout, but they can be a challenge. Since they are stocked far outside their range, they may differ in their behavior from one area to the next so it is best to find out what the locals are using to succeed and then copy their methods. Smallies are great game fish because they have a good level of top water fighting ability. This means they are going to put on quite a show when you are trying to reel them in. They are normally catch and release fish, but that is just fine considering how hard they fight for the right to survive. However, many enjoy eating these fish so keeping a few, in accordance with local laws, will give you a tasty meal. When Is Smallmouth Fishing Done? Most of the time, smallmouth fishing takes place during the regular fishing seasons in a particular area. This is typically late spring through early autumn. Most areas are not going to approve of smallmouth fishing in winter because they are simply not a common ice fish. Bass season is generally closed for winter, so make absolutely certain you know the laws before you attempt fishing in the winter months. But not all destinations in North America have seasonal restrictions. For example, Northern Ohio is a prime smallmouth bass hotspot that's open all year-round. Just be sure to follow catch and length limits that vary by water. Getting School'd host JP DeRose with a smallmouth bass. A very easy way to go after these fish and it has become a very popular technique for smallmouth in recent years. This is also called the down shot rig and it is known for getting steady bites although it may not be the best technique to try and bag the biggest fish in a given body of water. This technique simply involves attaching a plastic bait to a hook with a sinker, and dropping the line off the side of the boat. No casting required, all you do is bounce the lure (or live bait) off the bottom. Learning to tie the knots is as simple as researching some tying instructions online and these will generally offer visuals guides to help the aspiring drop shot angler. Low visibility line is crucial. Having a swivel on the hook can help because a little bit of shaking can go a long way with this type of approach. Early spring at the morning time is the best time for jerkbaits, though this is a technique that can work throughout the boat-fishing season.. The idea here is to move the bait along, generally an artificial bait designed for smallmouth, at a pace that can be described as jerking. The motions emulate dying fish, particularly shad in many parts of the United States, and these motions will bring the smallmouth on like crazy. It is definitely a smart idea to take a look around and see what others in your area are doing when it comes to jerkbaits. Knowing when to do a pull is definitely going to be paramount to having success with this method. Using plastic tubes when fishing for smallmouth can be an excellent strategy, particularly when you drag them across the rocks. Smallmouth bass love to hang around rocky ledges, making this lure particularly effective. Tube bait can work out exceptionally well for those who have a bit of experience, but newcomers to this style of fishing should know that it can be a little bit frustrating at the beginning as you are learning the ropes. Catching rocks on the bottom is quite probable, which can lead to breaking your line and losing your lure if you can't get it unstuck.With a hollow lure like this and the tentacle like streamers, dragging tubes are perfect for smallmouth. In one of the more exciting ways to fish for smallmouth, the burning spinner bait method is a colorful way to describe the art of 'burning' the bait through the water to try to get a reaction from the fish. If it strikes, the smallmouth will be a lot easier to hook this way and that can lead to a nice, aggressive fight from the fish. Many anglers recommend using willow leaf blade since they have less resistance to their spinning through the water which means they will go far faster as a result. This also means they will stay in the water rather than working their way to the surface where it will do very little good. Every fish loves live bait and smallies are no exception. For larger bodies of water with rocky structure, crayfish will be most effective. Leeches, minnows, and worms work on any body of water. Frogs can be useful on grassy lakes, though it should be noted that this particular bait is best used for largemouth instead. Since these fish can be a bit elusive, getting a smallmouth fishing report is definitely advised. The Tips section contains a wealth of information on bass fishing. 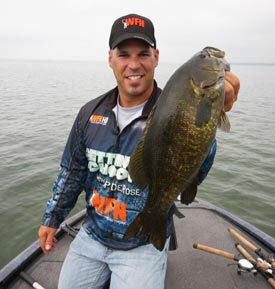 For those who want to get started at smallmouth fishing really should do their homework. Reading up on the subject with quality books and watching videos designed to share smallmouth fishing secrets will go a long way in educating you on catching this popular game fish. Another good idea is hiring a smallmouth fishing guide to show you the ropes and give you a chance to do the best possible job you can out there on the water. Keep at it and before you know it, you just might be the next smallmouth pro in the fishing magazines.